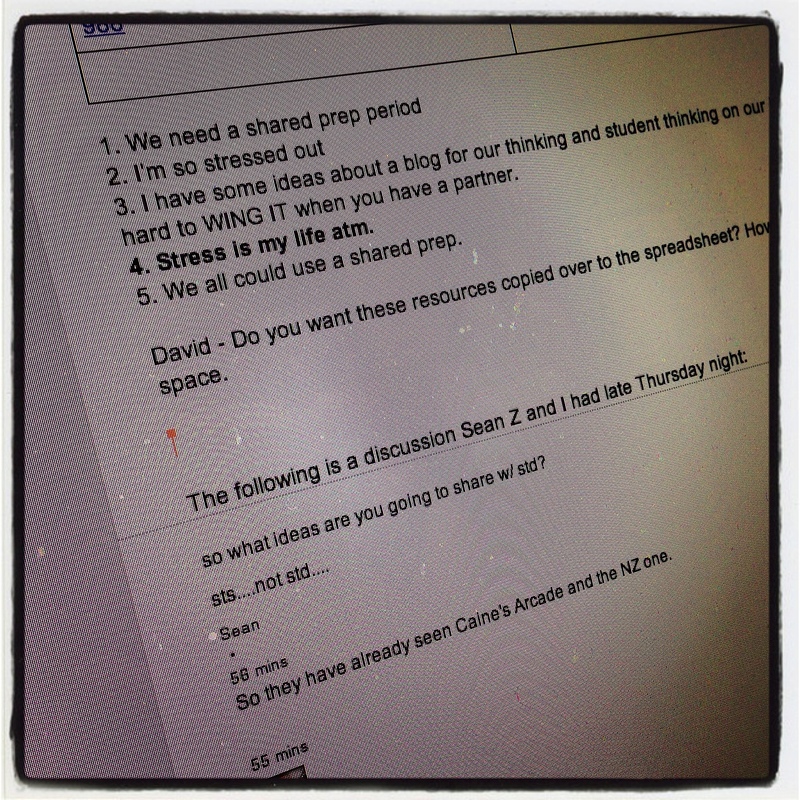 @drakemtbcoach and @chizzieb are DEAD serious about collaborating in plain view. We understand collaboration to be an essential life skill; we need to consider school models where adult collaboration is visible to st's. I don’t mean this to be a rhetorical question, but it feels awfully close to being one. Mostly kids just see us working alone, in our office or classroom. No evidence of how what we’re doing is the product of a collective effort (even when it most certainly is). So it was time to turn to my secret weapon: a CAlifornia/CAnada thought huddle with the awesome Robin Dubiel to throw down a CO-POST on the subject. @RobinDubiel @drakemtbdan @ecsaibel @ChizzieB @davidtedu Yes, yes, yes. Once when I was in David's class his students said: we want two Ts! Uh-oh – the Fiefdom-of-One has been invaded! TWO teachers in one room? It’s just…subversive. 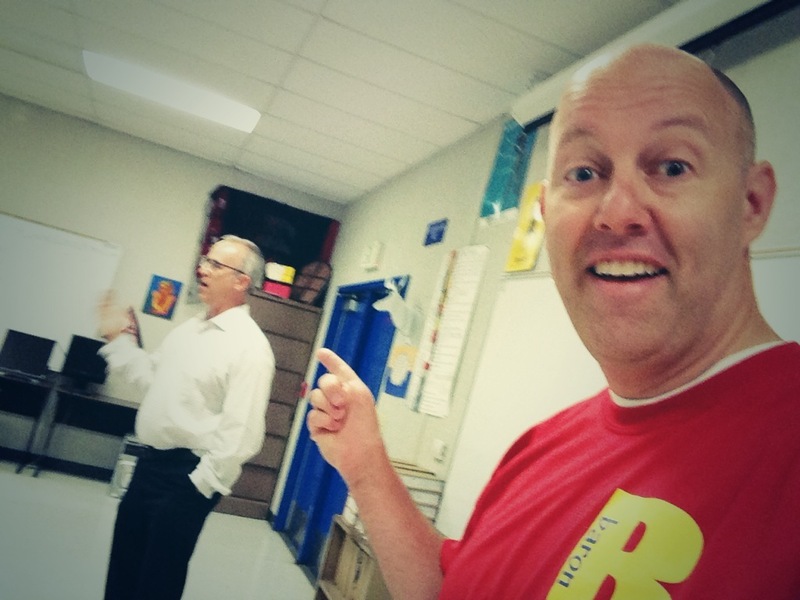 Sean/David (David/Sean) are two of my biggest inspirations – teachers seriously committed to kids, teamwork, and FUN. Here’s a screenshot of a recent collaboration between them, and some of Sean’s thoughts on why they choose to work together. Sean says: I shared this convo w/Theriault with my students to introduce our collaboration to them. We realized how challenging collaborating is, YET we as teachers expect our students to do it all the time. How often do teachers collab? Not enough. This is what it comes down to: a choice to connect with others and open up our doors (and ourselves) to their ideas, or a choice to do “our” thing and maybe share/collaborate/learn from others on an every-once-in-a-while basis. But that’s not all; they also have a G+ community with their students and practice Instructional Rounds with a large cohort (40+) of the teaching staff at their school (expanding to a district-wide model). A solid twosome isn’t enough to make an entire school/district great – but it can be a start! 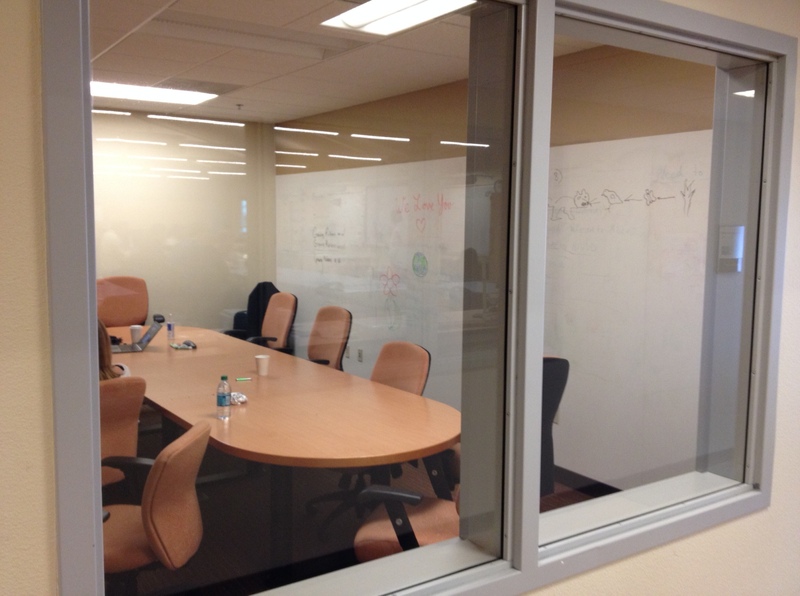 A recent visit to Napa New Tech High School “revealed” another terrific idea – so terrific that they BUILT it into the architecture: transparency of practice. Yes, I posted on this recently – after all, it’s my personal theme for the year; what I love about this is that it puts collaboration on display. If they were so inclined, the students could stand around and watch their teachers at work – but my guess is they probably don’t because now it’s just a standard, unsurprising part of the landscape. What effect do you think that has on the broader school culture? 2 teachers, 1 big room. On the fly collaboration in front of students shows students how to problem-solve, resolve conflicts, compromise and come to agreement (we do this all of the time). Parallel lives led to DHS. Shared interest in empowering students in leadership opportunities led us to Academy X. Shared interest in family led us to break up after 3(?) years (Dan having kids, Chiz losing Dad). Back together because of a shared interest in working collaboratively with one another to serve students and student learning in a collaborative, integrated, project-based approach, only this time taking on Frosh. Shared interest in CrossFit led us to spend 3-4 mornings a week planning together at 5:15am at the gym. Like we always say…you complete me! Sports focused childhoods. Homecoming court (she queen, me also-ran). 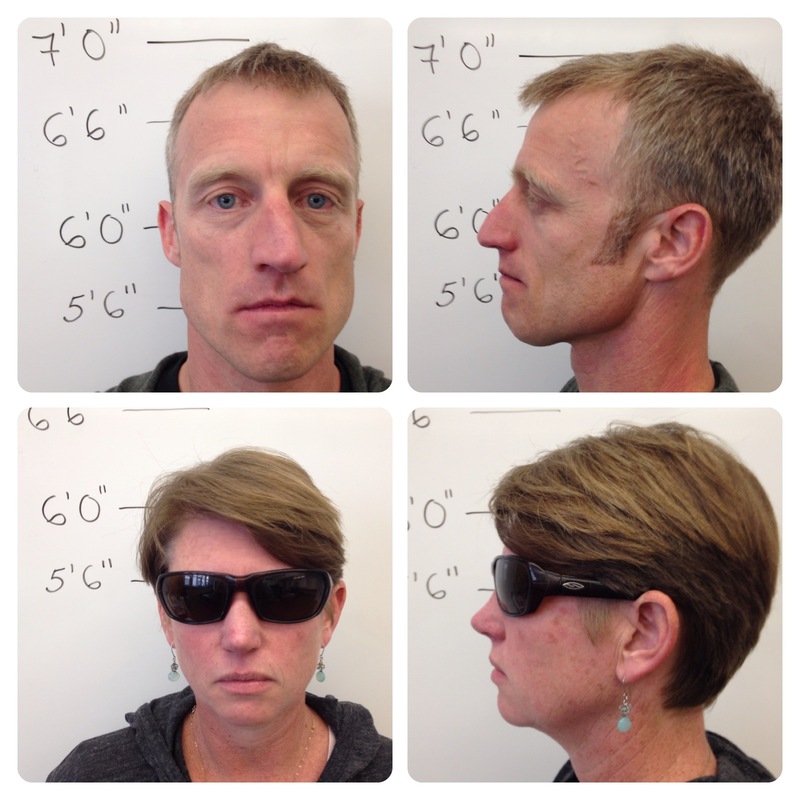 I will say that I have a HUGE respect for what Chiz brings to her students…that is critical. I have nominated her for Golden Bell EVERY year for as long as I have been working with her. I would not be half the teacher I am (know that is not saying much) without having her as a role model…and after 13 years, we are just getting started. Dan is my sounding board, my critical friend, my confidante, my cheerleader, my voice of reason, my foundation, my reprimand, my spirit-lifter. I doubt I am all those things to him, but he is the reason I love my work so much. And, we have no problem sharing this with our students, the parents of our students, our colleagues and the community. We believe in each other and work constantly on improving our practice, our “game” and lifting each other to the next level. In fact, sometimes I feel guilty getting paid for working with Dan. What it ALL boils down to is our mutual sense of commitment to kids and forging healthy relationships with our colleagues (heck, how many educator couples do we know?). If we don’t have both things at work, there is no way we’ll be able to truly push each other (e.g., UP our GAME) in order to meet the needs of all of our students. We need to be at ease with each other, while also looking out for the black hole of the echo chamber that emerges when we’re TOO comfortable and chummy. We are friends and that makes our work together richer. Being friends, however, is NOT the reason we’re educators – that deeper purpose, of course, centers on student learning, growth, and (as David Theriault says) helping them make the NOW a special, important, meaningful experience. The learning journey doesn’t EVER stop, certainly not when we’ve finished getting our formal degrees/titles from academic institutions. Learning is life, it is the “process of living” itself (John Dewey via William Tolley). The first step to building cultures of visible adult collaboration is to find, as Chizzie says above, your critical friend, confidante, and cheerleader. In order to replicate that spirit in this blogspace, Robin and I decided to VISIBLY collaborate over international boundaries and several time zones to enhance each other’s thoughts on a topic that is dear to both of us. Her post – the bacon to this doughnut – is here. Posted in Organizational Growth and Change, Personal Growth and Learning, School Culture, Teaching, UncategorizedTagged Chizzie Brown, Collaboration, Dan Freeman, David Theriault, relationships, Robin Dubiel, School culture, Sean Ziebarth, TransparencyBookmark the permalink. 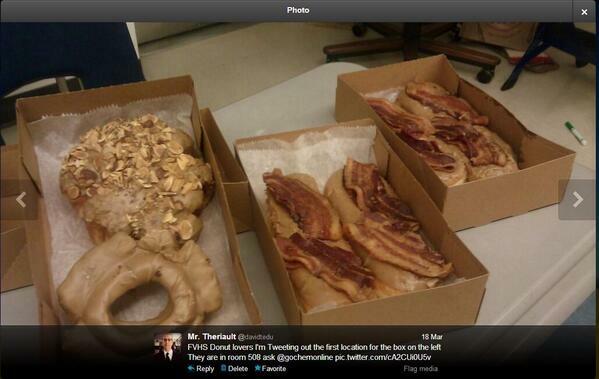 I am loving the donut and bacon references! Such excellent, real life examples of collaboration in action. I’m now considering the super teachers I know who’d be willing to share in this blogging adventure. Not only is this EduAwesome! It is actually quite heart-warming. I love what Chizzie and Dan said about each other, and of course, Sean and David are an inspiration. Two teachers in one big room seems so practical, almost too easy, why isn’t it happening more? The idea that this is exactly what we are asking our students to do- yet most of us are not doing it is a rude awakening. Wow, thanks again for another great post! This post is only as great as its INGREDIENTS – as you’ve pointed out, they are tasty, organic, whole grain, heirloom, free-range, grass-fed (w/a side of bacon) WHOLESOME. That plus the awesome Robin Dubiel who is one of those special connections that would never have happened were it not for Twitter. Thank you so much for your thoughts and the rah-rah!! !